I’ve fallen far behind on my new music listening; the stack of great music out there grows faster than I can get to them, sadly. While I winnow down the pile, I’ve spent most of the week listening to some wonderful, relatively new folk releases from Compass Records, and let me tell you, I’m impressed. The folks at indie roots label Compass, who became sales-parent to Celtic folk-oriented label Green Linnet just two years ago, are caretakers for a surprisingly large stable of true and traditional-leaning folk artists, but there’s little chaff in this wheatfield; when they play to their strengths, their hit-to-miss ratio is far better than the industry average. And the combination of Green Linnet’s artist roster and Compass Records artist-oriented approach to distribution seems to be a winner for all of us. Today, we feature the coversongs of three Irish artists who have emerged from this fruitful collaboration to release authentic, predominantly acoustic records in partnership with Compass/Green Linnet in the last year. If Heidi Talbot sounds familiar, it may be because you heard her as lead singer of long-standing Irish-American supergroup Cherish The Ladies, and it may be because, like the folks who commented when Muruch posted about Talbot’s newest album way back in January, you were lucky enough to hear her on your local folk radio show, and made it a point to follow up. It certainly isn’t because you’ve heard that many other artists with voices as confidently and carefully understated as Talbot’s. 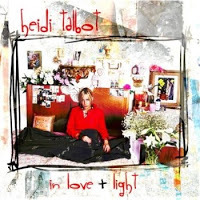 I Love + Light is Talbot’s second solo outing, and this sophomore album shows a singer and songwriter on the verge of going singer-songwriter. 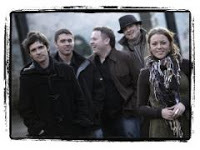 The tracks range broadly from intimately performed Celtic music to a delicate acoustic folk that would sound welcome in any coffeehouse; overall, they make for a perfectly balanced post-americana album, a return to the broad roots of the folk tree which gains everything from Talbot’s eclectic experience as a musician on both sides of the Atlantic. I Love + Light won an Indie Acoustic award for best album just a month ago; supposedly, Talbot will also appear on an upcoming album by Radiohead’s drummer, and we all know how popular Radiohead is on the blogworld. For some reason, though, blog searches reveal few hits. Clearly, Heidi Talbot is still working on building up her name recognition, and I’m happy to help by adding my recommendation. Buy I Love + Light, start listening now, and one day, you can say you knew her when. My wife isn’t an audiophile; rather, she’s the kind of music listener who really only likes a few very particular CDs, one for each mood. So when she kept returning Cloudy Day Navigation in the CD changer, I knew it was worth a second listen myself. Sure enough, this third release from Grada is modern ensemble celtic folk music at its best and most authentic: earnest instrument-play, a flowing sound, lilting melodies, and a wonderful female lead singer who effortlessly displays that indescribable something that all great irish chantesuses have. The production is just light enough to keep things intimate, and when the song calls for such delicate delivery, they really shine. Overall, Grada is an irish-american band to watch; even without its bonus live performance DVD, Cloudy Day Navigation would be eminently worth owning. Their cover of Suzanne Vega’s The Queen and the Soldier — one of my favorite from this american singer-songwriter — recasts it so perfectly in the storysong tradition of the Emerald Isle, it’s as if it always belonged there. And Susan McKeown’s River is perfect Sunday afternoon putty in their hands, all light harmonies, softly plucked strings, and flute and fiddle. The rest, from traditional reels to sweet celtic folk, is much the same. Karan Casey was the original vocalist for fave celtic folk band Solas; these days, as a solo artist, her sound falls somewhere between the irish folkpop of Mary Black or Sinead O’Connor and a slightly sparser version of the dark side of Irish ballad music, where Enya and Loreena McKennitt live: more production, more drone, mostly ballads, and overlaid with languid atmospheric effects on string and pipe. 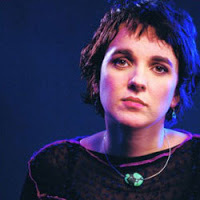 But though my wife listens to the latter pair of aforementioned sirens, she wasn’t as taken with Karan Casey as she was with Grada, and I think I know why: though the surface medium here is irish siren, Karan’s music is more folk than new age. Casey’s drawn-out delivery succeeds best when she veers closer to the kind of irish/appalachian pop sound that wins Sting and Alison Krauss their Grammy awards, such as with this Joni Mitchell cover, and her version of traditional song Black is the Color of My True Love’s Hair, both from her new release Ships in the Forest, which is technically self-released but licensed through Compass in the US. The approach may not be my wife’s favorite, but it’s my cup of tea for sure; in my book, any music which focuses on this particular singer, coupled with an entirely plausible yet predominantly acoustic atmospheric production, makes Karan Casey worth a second listen.